June 2015 | Pentaflex INC. June 2015 | Pentaflex INC.
At Pentaflex, we pride ourselves on our dedicated team to which we know are the backbone to making us a great success. Recently, we took on two bright, eager, driven summer interns, and we’re happy to welcome them. Carissa Myers and Joseph Lacey are excellent examples of how we bring in young people from our community who want to learn and grow and make a difference in the American workforce. Carissa is a senior at Southeastern High School, and Joseph just graduated from Kenton Ridge High School this past May. They both came to us through our partnership with the Greater Springfield Career ConnectED program, which organizes summer internship opportunities for high school students in Clark County who are looking for hands-on experiences with local businesses. Students who wish to participate in the program must submit an application prior to acceptance, and once accepted, they undergo several training programs, which help them develop their soft skills and safety awareness. Once the training is complete, they are then interviewed by businesses like ours. We are proud to participate in this exceptional program, helping to develop the next generation of the manufacturing workforce, including participants like Carissa and Joseph. They will both be working for our engineer, Bob Mayberry, helping to analyze setup time reduction, 6s activities, design of experiment programs, and ppap data collection. We’re very happy to welcome them to our family for the summer, and look forward to providing them with an educational opportunity that will surely make a difference for their future. A company is only as good as the people it employs; great products and service don’t exist without great people. At Pentaflex, we know this well—and we’re more than a little proud of the 100+ team members who have made us who we are. We like to celebrate them all, individually and as a group. Recently, we chose to celebrate the contributions extraordinary women make and have made to our company and our industry. 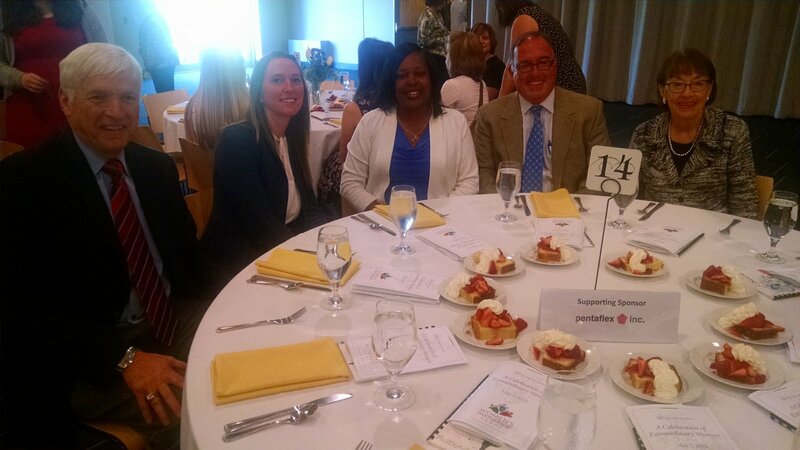 This is why we recently sponsored the Springfield Foundation’s Extraordinary Women’s luncheon. This event was organized by the Women’s Partnership Fund, an affiliate of the Springfield Foundation. Chairwoman of the Partnership Fund, Cathy Crompton called it an “uplifting, powerful event.” Over 300 guests attended the luncheon to celebrate the hard work and commitment of women and their invaluable contribution to the community. It was also a chance to focus on the importance of encouraging young women to pursue personal and professional success in any field that interests them, regardless of traditional gender roles, stereotypes, or norms. The message was certainly clear- young women should be encouraged to fulfill their dreams regardless of cultural stereotypes. After all, there are many opportunities out there in fields that are not “typically” filled with females—including manufacturing—and there’s no reason why more women can’t benefit from them. In attendance from Pentaflex were David Arndt, our President, Julie McGregor, our owner, Ross McGregor, Executive Vice President, and Debbie Kidd, our accounting whiz, and Laura Ark, Customer Service representative. Each thrilled and delighted to celebrate the cause and message on which Pentaflex embraces. Everyone who makes Pentaflex so successful is indeed extraordinary. The women who make us and our community so great are certainly no exception, and it was an honor to celebrate them.